By Costa Maragos Posted: August 30, 2017 6:00 a.m.
Regina’s Tartan Curling Club has been transformed into Saskatchewan’s biggest bookstore. Instead of sheets of ice, there are long rows of tables, jammed packed with books, DVDs, CDs, LPs and much more. 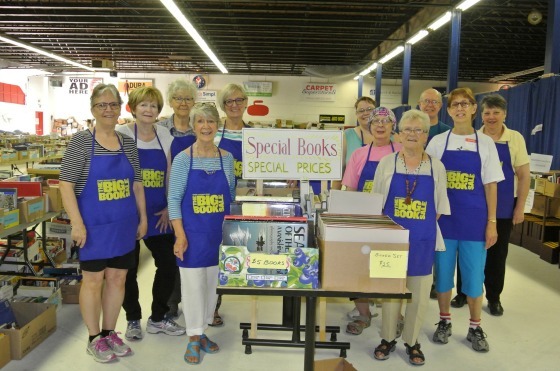 The annual Big Book Sale takes place August 31 to Sept 2 and is run by volunteers from the Seniors’ University Group. Most of the proceeds are directed at programming for the University’s Lifelong Learning Centre. Regina’s Tartan Curling Club is filled with thousands of books and much more catering to all ages and interests. 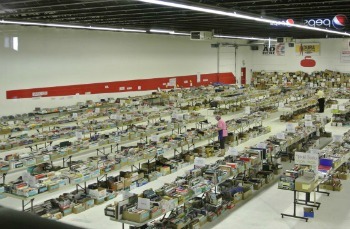 This annual sale started in 2007 at the College Avenue Campus. However, due to the sale’s growing success and increase in donations, a much larger space was needed. “This year’s sale is our biggest yet,” says Bev Barlow, the person responsible for promotion and publicity. The donations add up to a huge selection. Organizers say there are about 55,000 books for sale. The books are nicely separated into dozens of categories. Interested in Saskatchewan history? Look for the Storm of the Century which examines the Regina tornado of 1912. Volunteer Anne Heal with a copy of Peanuts – the art of Charles M Schulz. Are you a gardener? There’s a prairie gardening section. Do you love the Riders? You’ll find a wide selection of football fare including Regina Rams – A Winning Tradition by Bob Hughes. There’s a long table featuring children and young adult titles. Most hard cover books sell for $2 and most paperbacks go for $1 apiece. However, you will find some pricier items in the special books section. “The Tartan is a wonderful venue, friendly staff, very accessible, good parking and a bus stop right out front. 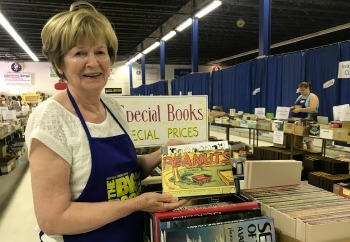 People leave this sale with bags and boxes full of books, DVDs, LPs, CDs, puzzles and more,” says Ann Bishop, one of the sale co-chairs. Those DVD’s are sure to attract attention. 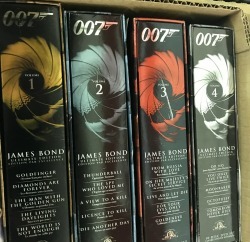 There are about 1,100 DVDs for sale including a four-set James Bond movie compilation. There’s a chance you’ll find a DVD featuring your one of your favourite TV shows including the Mad Men series and for you classic TV lovers we spotted part one and part two of Bonanza. Looking for music? You have about 4,000 CDs and 800 LPs to choose from. Love James Bond? Check out this DVD set. 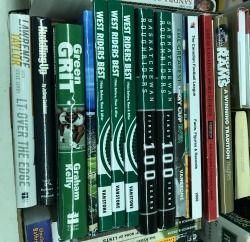 A nice selection of books for Roughriders fans. As in previous years, unsold books are donated to dozens of organizations around the city. Books are also donated to the men’s and women’s jails in Saskatchewan. “We’re pleased to support all of these worthy projects,” says Bishop. The sale enjoys key support from the Tartan Curling Club, Crown Shred and Recycling, Mike’s Independent, Staples, Loraas Disposal and the University of Regina. For more information on the book sale please visit here. Are you looking for a fun learning experience? The U of R’s Centre for Continuing Education offers a wide array of classes. Please visit here for the program guide.